All-inclusive vacations certainly have the ability to rid travelers of many of the headaches associated with planning a trip. Before you book a package deal, though, consider how the pricing breaks down when compared to booking each component separately. That's the best way to determine if an all-inclusive package really makes a big difference in cost. Booking an all-inclusive vacation can mean something different depending on the country and the resort you choose, but most packages will include airfare, accommodations, and unlimited food and drink. If you relish the idea of enjoying daily cocktails by the pool and don't want to have to worry about individual meal costs, this is definitely the cheapest way to book. Caution: Make sure to verify that any package you are considering is truly all-inclusive, meaning that it includes all meals. Many times, pricier resort destinations like Bermuda will offer packages without food (called the European plan) or packages that include only breakfast. Airport transfers are sometimes included in all-inclusive packages, but not always. These can be easily overlooked in the booking process but are integral to a smooth trip. If they are not included in your package they will typically cost around $30 dollars per person. Make sure you've locked down this component prior to travel as it will be more costly (in both time, money, and stress) to leave this until your arrival. Some resorts offer lessons in a local practice, such as Salsa dancing or Spanish lessons. These are often offered for free whether you book an all-inclusive package or through the hotel directly. This is a great way to connect with local customs and learn a little something you can take back home with you. Resorts often offer additional activities on-site that are not included in the price, even if you book an all-inclusive package. This might be scuba diving lessons or spa services. If you plan to do any excursions off the resort, they will likely be bookable on-site but will cost extra. Two example breakdowns of the pricing difference between booking an all-inclusive trip and booking each component separately are provided below. One shows the value of an all-inclusive vacation versus a separately booked vacation at the same resort and the other shows the value that flexibility can bring when booking an all-inclusive trip. This case study is for a trip for two people traveling for seven days from New York to the Royal Decameron Los Cabos in Los Cabos, Mexico. Prices fluctuate depending on travel dates and proximity to departure date, but this is a typical pricing difference when booking about a month in advance for travel during the high season (winter in North America, when most travelers prefer to book these types of trips). Includes flight, hotel, airport transfers for two, and unlimited food and drink. You can duplicate the same experiment for your preferred destination and dates by visiting Bookit.com (as was done for this example) and searching their all-inclusive package deal prices. Then visit the resort's website directly for hotel rates and food prices and Google Flights for current airfare. This contrast will quickly give you an idea of the value of booking all-inclusive for your preferred travel details. A second example illustrates the value of being flexible with the specifics of your trip. This contrasts two separate but equal resorts in Bermuda, one all-inclusive and one not. Pricing is for a four-night stay for two people from Fort Lauderdale booked six weeks in advance of travel. The example uses different resorts and different travel dates (within the same week) so that both options reflect the best possible pricing conditions and value. This example also shows the value of booking all-inclusive even if you don't plan on indulging in any alcohol, which is another thing to consider when booking your trip. Grotto Bay Beach Resort: Includes flight, hotel, airport transfers for two, and unlimited food and drink. Both of these examples show the cheapest time to travel to the respective resorts in the month of February. 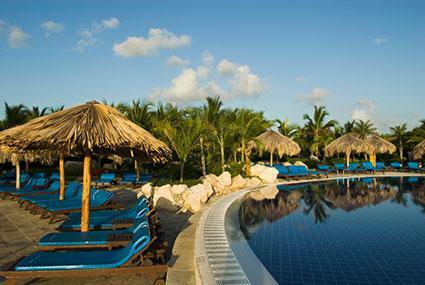 The all-inclusive vacation package begins on a Tuesday, the other on a Saturday to reflect the best prices. Flying on Saturday may be more beneficial in terms of vacation days, and the adjusted price for the all-inclusive for that date would be $2,500, still reflecting a significant savings. Some resorts will offer the ability to book all-inclusive trips directly on their website, but you can usually find better deals by going through third party providers like Bookit.com or Expedia (search under 'bundle deals'). You may also find it beneficial to work with a travel agent. Always contrast as many sources as possible to be sure you are getting the best deal. The savings for most all-inclusive destinations can be significant. Depending on your travel dates and how far in advance (or how last-minute) you book they can be even more drastic. Also, booking all-inclusive means everything will be taken care of for you and you won't have to worry about anything once you are on the resort. You can enjoy as much food and drink as you'd like without worrying about the cost. When booking all-inclusive vacations, you have less flexibility if you are looking for the best deal. To really save money, you may end up with less-than-ideal flight times that could require an overnight stay at the airport, an extremely early morning, or an extra day off work. You will also be bound by the particulars of whom you book with and the amenities they offer (they may restrict which restaurants you can visit, etc.). If you plan on indulging at mealtime or sipping even the occasional drink by the pool, a truly all-inclusive package is definitely the way to go. You don't want to be over-thinking all your food decisions, and even if you're extremely conservative, the all-inclusive option is still the better deal. If you are flexible with your travel dates you'll be able to find significant savings, especially if you are able to wait until the last minute to book. Once it gets closer to the travel date, resorts and airlines will start to lower the prices as they realize how many seats/rooms they have yet to fill for a particular travel date. Ultimately, the value of booking all-inclusive depends on your desired country, hotel, and travel dates. You can end up saving a lot of money if you are flexible with these three factors.